Chairperson of the Eskom Board, Jabu Mabuza, will return to the stand when the Commission of Inquiry into State Capture resumes in Parktown, Johannesburg, on Monday morning. On Friday, Mabuza detailed events that led to the resignation of Board members and the disciplinary of former executives for wrongdoing. Mabuza said George Sebolela was asked to resign from the Eskom Board for not declaring his interests in companies that were doing business with the power utility. A bidder, who was seeking a tender at Eskom, declared Sebolela’s interest when he was asked to disclose any relations with Eskom members. Mabuza said various law enforcement authorities were looking at different matters. Mabuza said when the current board was appointed, it had to deal with ethical and liquidity issues as well as the cleaning up of Eskom. He, however, said there were more challenges. Energy expert Ted Blom says if Eskom Board Chairperson Mabuza’s perceived conflict of interest had been known prior to his appointment he would not be holding his current position. Evidence leader with the Commission of Inquiry into State Capture, Advocate Vincent Maleka asked Mabuza about the perceived conflict of interest when he appeared before the Commission in Parktown, Johannesburg, on Friday. Mabuza confirmed owning a stake in Sphere Holdings – an investment holding company whose subsidiary does maintenance work on a third of Eskom boilers. The Economic Freedom Fighters (EFF) is now demanding his resignation. Blom says this a major problem. “He hurriedly has to throw his assets into a giant trough as he testified. Not only is he involved with coal, he also holds very large interests in companies that do Eskom maintenance. The problem with the coal is on the short-term purchases, which seems to be where his wife and his family are involved, on the one side and the problem with Eskom being in the midst that they are is the operational maintenance problem and seemingly there is an excess between the supplier of those maintenance services and Eskom,” says Blom. 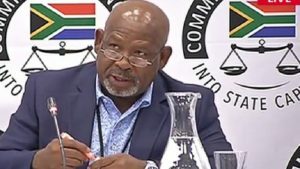 The post Eskom’s Jabu Mabuza set to return to the stand at the Zondo Commission appeared first on SABC News – Breaking news, special reports, world, business, sport coverage of all South African current events. Africa's news leader..